Unfortunately I don't see any error.txt file. When I went to the download page of your website and downloaded the game it gave me a winrar version of the game which I extract to get the game. The game opens but if my OBS is open and recording as well the game for some reason stops working and forcefully closes. But if I'm not recording the game works fine. I was even looking forward to advertise your game. I may have to look other ways to do that. Maybe in the latest version log generation was disabled. I've uploaded a new version for windows, the 1.1.1, that should generate logs. When you open the game and it crashes, check again and look for two files: error.txt and output.txt. Let's see if there are any useful information in any of those. Maybe it's a configuration or hardware issue. We've seen several people sharing recordings of DigDeep on YouTube, so it's definitely possible. Have you tried using a different recording software? 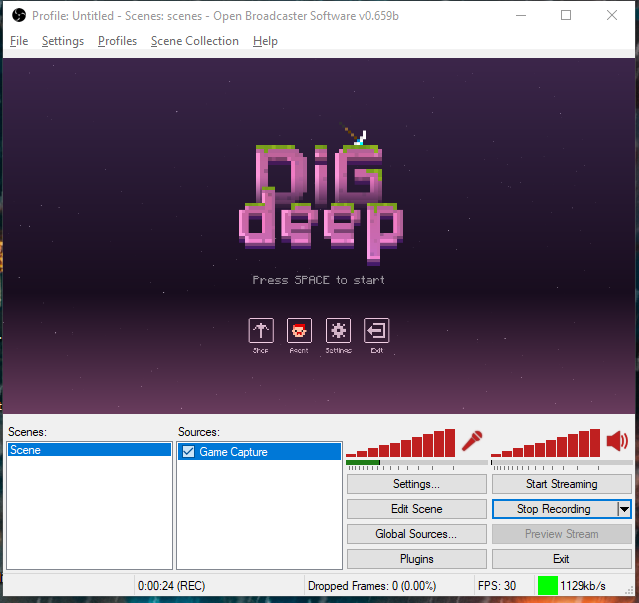 On the other hand, I've installed OBS classic and tried recording the game without any issue. I don't know very much how to use this software, but I'm attaching a couple of screenshots so you can check my configuration. I hope some of this will help you!